Hedgehogs can be absolutely wonderful pets for adults, youth, and children alike. However, hedgehogs can also be one of the worst pets for the wrong person of any age. Each child and family will have a different experience with his or her hedgehog. Some families do absolutely wonderful with their new pet and their hedgehog is an integral part of their family. Other families end up with an un-socialized, huffy, puffy hedgehog that is rarely taken from its cage. Our experience over many, many years is that a child’s experiences with other animals plays only a small part of the success with being able to bond with and handle a hedgehog. While the experience of responsibility and patience is important, hedgehogs have their own unique handling requirements, which are much, much different than other animals. We have found that hedgehogs do best in families where both children and adults learn about the care and needs of a hedgehog before a hedgehog is purchased. Many times, preparation can avoid serious problems. Carefully researching the needs and characteristics of hedgehogs will ensure that a hedgehog is the right pet for your family. The ideal situation is when an adult has as much interest in the hedgehog as the child. When a child loses interest in their pet it is the parent’s responsibility to take full responsibility of the hedgehog. If an adult wants no involvement with the hedgehog, it is not a good pet for the family. One must understand that hedgehogs are a very unique and that their handling requirements are very different compared to any other type of pet available. Hedgehogs fit best as family pet and when adults are closely involved in daily hedgehog care. It is extremely important to monitor the hedgehogs eating, activity levels, temperature, and health every day. Parents should be confident in their children’s abilities to understand and accept the special care and handling needs of a prickly pet. Learning responsibility in the care of a pet is a wonderful life skill to teach young people. When children are excited about “their” pet they are more likely to participate in daily care and learn to take more responsibility in the hedgehog’s care. Children under the age of ten should assist in the care of the hedgehog but an adult should have full responsibility of the hedgehog. 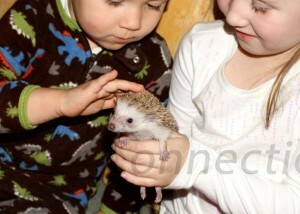 Most children will need assistance in socializing their hedgehog to daytime activity. Even though hedgehogs are nocturnal animals, hedgehogs can adjust to daytime activity through regular handling. Older children often have the skill level needed to care for a hedgehog, they become more active in school, work, and time with their friends so their time with their hedgehog is limited. Children and adults alike have expectations of what a hedgehog is going to be like as a pet. Without a thorough understanding of the specialized care and handling hedgehogs require it is easy to become disappointed. Hedgehog owners will get poked – even the nicest hedgehogs have sharp quills. Hedgehogs feel different than other animals. Holding a hedgehog is more like holding a cactus than a hamster. When held correctly, they can be rather soft and even cuddly, but it does take handling skills that unfortunately some hedgehog owners never learn. Anything with teeth can bite and that includes people and hedgehogs alikeJ. Sometimes animals use their teeth to explore (get a better taste) their environment, express dissatisfaction, and/or defend themselves. Any animal can pass a disease on to humans just like humans can pass diseases on to humans. Hedgehogs are not known to carry specific diseases. Hedgehogs are not the best pet to be kept in a child’s room. Hedgehogs’ nocturnal nature may keep the child awake at night, and the need for an additional heat source may be a safety hazard for your child depending on the source used. A hedgehog can be a companion, friend, and confidant. Caring for a pet teaches responsibility, respect, and compassion. Having a pet that is a little different than most is a fun aspect of hedgehog ownership. Caring for a pet is often one of the most memorable experiences of childhood. Hedgehogs can be easily dropped which could result in a variety of internal and external injuries. Children may unintentionally squeeze their hedgehog trying to restrain it, which could cause internal injuries. The hedgehog may become neglected if it is not the right pet choice for your family. A hedgehog may become fatally ill if its unique needs are not met or if early signs of an injury or illness are not recognized. Too much attention or over handling may stress the hedgehog. When a youth saves their own money for a pet, it is a sign that they take responsibility seriously and they are committed to owning a pet, rather than a passing desire. The initial costs to purchasing a hedgehog and needed cage, accessories, and supplies can be costly. Veterinary care for any pet is often more costly than the initial purpose. It is often unrealistic to expect youth to be solely responsible for 100% of future financial needs. Children without a steady source of income obviously cannot be expected to be financially responsible for all of the pet’s needs. It is very crucial that an adult is involved in the bonding, handling, and daily care of the hedgehog no matter what age of the child. Youth often do not notice changes in health, weight, or eating and drinking habits. Children should not be considered as the main caretakers. A list of responsibilities should be established before bringing the hedgehog into your home. While your child may be able to perform all aspects of care on his or her own, it is still your responsibility to monitor and make sure duties are being carried out on a daily basis. Nicole from Prickly Pair Hedgehogs states that 99% of her hedgehog returns have been from a child either losing interest in the pet as the novelty fades or because the child is too fearful to handle the quilly pet. Animals are not disposable and you should very carefully consider the information above before purchasing a hedgehog as a pet for your child. Gail at Millermeade Farms has found that hedgehogs make the best pets in families where either one or both parents has as much or more interest in hedgehogs as a pet than the child. It is ok for parents to let the youth think it is their pet as long as an adult also has an active role in its care. This is an update from one of our customers. The family has two hedgehogs and were purchased for the son and mother. We have a daughter, she is bipolar and has some major anxiety issues. We were worried about how she would react to the hedgies (spiders, snakes, mice and such are definitely not on the list of her favorites). She loves them! She holds them and talks to them. We were shocked!! Turns out they make great therapy animals too!! 😀 Trish S.
Please understand that hedgehogs can make great therapy pets but they take special adult care and supervision.